As 2011 winds down, it is hard not to make comparisons with 1981. Then, as now, the whole country was in the grip of ideologically-driven Tory austerity with attacks on the fundamental pillars of the state and the most vulnerable in society; unemployment was at record levels, as is youth unemployment today; there was also rioting on the streets, although the mass shoplifting of 2011 does have some differences to the eruption of anger at police oppression and hopelessness in England’s major cities thirty years ago. Back in 1981, the trade union movement was at the forefront of opposing the attacks on working people and, as a young local council worker, I found myself striking to defend jobs and services; in 2011, and now a teacher, I have twice had to take industrial action in protest at the government’s attempts to raise an additional deficit tax from public sector workers under the guise of pension reform. How essential public sector workers ended up being the villains, whilst the bankers who haemorrhaged the economy continue to award themselves bonuses, leaves me feeling sad and angry; but not surprised. A Tory party that receives 51% of its donations from the financial services sector was only ever going to treat the real villains favourably. Osborne deferred any real reform of the banks for eight years and Cameron went as far as trashing Britain’s role in the EU to, supposedly, protect an industry that only accounts for 10% of the economy. This is set against the fact that manufacturing in this country relies on the EU for 48% of its exports; but at least he has made those swivel-eyed Europhobe back-benchers of his happy. There has been no support from the Labour Party, of course, for those who are standing up to the Tory bullies and, even now, union leaders have begun to say that the protest was always about “damage limitation”. It seems certain that there is about to be a compromise – in other words, a defeat - on the pensions issue. Our actions in June and November will have been for nothing. All of the public sector workers and trade unionists I have spoken to were not trying to limit damage, they were striking in outright opposition to plans to make us pay more, work longer and get less. Despite this capitulation by most union leaders, we should continue to oppose this pernicious government of Tories and Liberal Democrats and their class war. 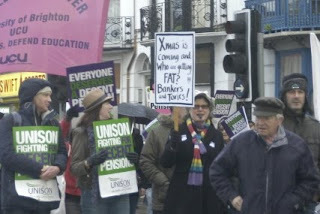 With increases in pension contributions and pay still frozen, 2012 will be another difficult year: evermore creative ways to make ends meet; no holiday for the kids; any entertainment carefully rationed. We might be under the yoke but we will get by on what we need; and we should fight back. Major political parties are morally bankrupt and we must support each other through groups and networks that are available. The Brighton Stop the Cuts Coalition and the Hastings Anti-Cuts campaign are both groups of individuals, community campaigns and local trade unionists standing together to fight the cuts. In 2012, get involved and stand together because in 1982 things got even worse. Happy New Year.